The Chechen Republic (pron. : /ˈtʃɛtʃɨn/; Russian: Чече́нская Респу́блика, Chechenskaya Respublika; Chechen: Нохчийн Республика, Noxçiyn Respublika), commonly referred to as Chechnya (/ˈtʃɛtʃniə/; Russian: Чечня́, Chechnya; Chechen: Нохчийчоь, Noxçiyçö), also spelled Chechnia or Chechenia, sometimes referred to as Ichkeria (English: Land of Minerals), is a federal subject (a republic) of Russia. 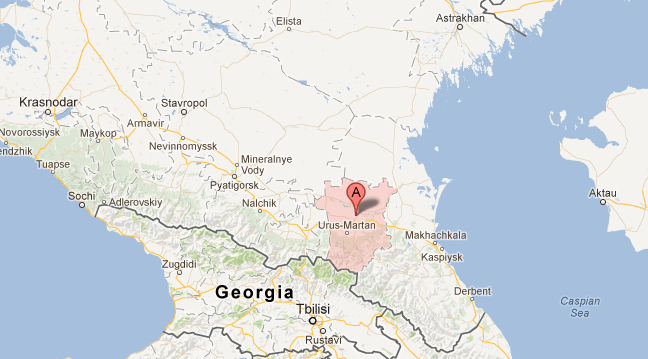 It is located in the southeastern part of Europe in the North Caucasus mountains. The capital of the republic is the city of Grozny. Population: 1,268,989 (2010 Census). After the dissolution of the Soviet Union in 1991, the Chechen-Ingush ASSR was split into two: the Republic of Ingushetia and the Chechen Republic. The latter proclaimed the Chechen Republic of Ichkeria, which sought independence. Following the First Chechen War with Russia, Chechnya gained de facto independence as the Chechen Republic of Ichkeria. Russian federal control was restored during the Second Chechen War. Since then there has been a systematic reconstruction and rebuilding process, though sporadic fighting continues in the mountains and southern regions of the republic. Ichkeria is/was a member of the Unrepresented Nations and Peoples Organization. Former president of Georgia, Zviad Gamsakhurdia, deposed in a military coup of 1991 and a participant of the Georgian Civil War, recognised the independence of Chechen Republic of Ichkeria in 1993. This recognition is no longer in effect.Diplomatic relations with Ichkeria were also established by the partially recognized Islamic Emirate of Afghanistan under the Taliban government on January 16, 2000. This recognition ceased with the fall of the Taliban in 2001. However, despite Taliban recognition, there were no friendly relations between the Taliban and Ichkeria- Maskhadov rejected their recognition, stating that the Taliban were illegitimate. Ichkeria also received vocal support from the Baltic countries, a group of Ukrainian nationalists and Poland; Estonia once voted to recognize, but the act never was followed through due to pressure applied by both Russia and the EU. The president of this government was Aslan Maskhadov, the Foreign Minister was Ilyas Akhmadov, who was the spokesman for Maskhadov. Aslan Maskhadov had been elected in an internationally monitored election in 1997 for 4 years, which took place after signing a peace agreement with Russia. In 2001 he issued a decree prolonging his office for one additional year; he was unable to participate in the 2003 presidential election, since separatist parties were barred by the Russian government, and Maskhadov faced accusations of terrorist offences in Russia. Maskhadov left Grozny and moved to the separatist-controlled areas of the south at the onset of the Second Chechen War. Maskhadov was unable to influence a number of warlords who retain effective control over Chechen territory, and his power was diminished as a result. Russian forces killed Maskhadov on March 8, 2005, and the assassination of Maskhadov was widely criticized since it left no legitimate Chechen separatist leader to conduct peace talks with. Akhmed Zakayev, Deputy Prime Minister and a Foreign Minister under Maskhadov, was appointed shortly after the 1997 election and is currently living under asylum in England. He and others chose Abdul Khalim Saidullayev, a relatively unknown Islamic judge who was previously the host of an Islamic program on Chechen television, to replace Maskhadov following his death. On June 17, 2006, it was reported that Russian special forces killed Abdul Khalim Saidullayev in a raid in a Chechen town Argun. The successor of Saidullayev became Doku Umarov. On October 31, 2007 Umarov abolished the Chechen Republic of Ichkeria and its presidency and in its place proclaimed the Caucasian Emirate with himself as its Emir. This change of status has been rejected by many Chechen politicians and military leaders who continue to support the existence of the republic.